Home SPORTS Ingwe cruise 2-0 to complicate Thika United’s relegation battle. Ingwe cruise 2-0 to complicate Thika United’s relegation battle. Thika United forward Shami Kibwana (left) battles for the ball with AFC Leopards midfielder Duncan Otieno during their SportPesa Premier League match at Thika Sub-County Stadium yesterday. 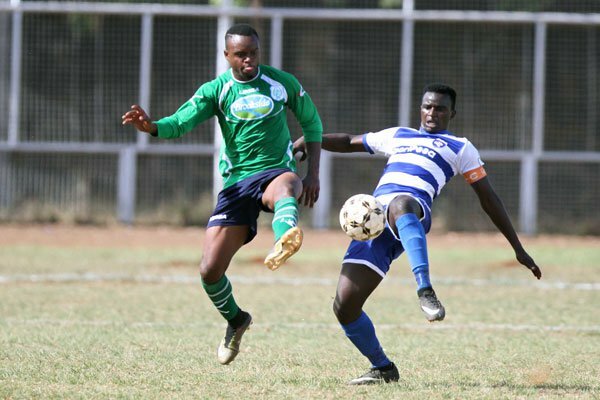 Thika United lost 2-0 to AFC Leopards on Wednesday at the Thika Sub-County Stadium in a thrilling midweek SportPesa Premier League match. Alexis Kitenge’s first half goal and a Christopher Oruchum second half own goal eased Ingwe’s relegation fears but on the other hand compounding those of the milkmen who were also in need of three points to get off similar situation. It was a pedestrian start to the match, none of the two sides injecting much of pace, evidently their energies sapped from playing their fourth match in a week. On either side, Said Tsuma for Thika and AFC’s Kitenge tried their luck with shots from distance but both were handled well by the keepers. In the seventh minute, youngster Vincent Oburu showed some sublime skill to skip away from two of his markers, but his eventual shot was deflected for a corner. In the 18th minute, AFC had another effort on target, this time from a Duncan Otieno free-kick which however, deflected off the wall taking much sting off it. However, it was the Robert Matano coached side, who started well and after missing several chances, they took a deserved lead in the 37th minute courtesy of Alexis Kitenge. Duncan Otieno had played in a good corner which fell to defender Robinson Kamura, and the latter floated in the ball which was well received by Kitenge, who did well to put the ball into the net. Ian Otieno made a couple of saves to ensure his team kept the lead, with Vincent Oburu and Whyvonne Isuza also missing great opportunities to double the advantage. Thika’s tact for response was to use their strength on the flanks with Eugene Mukangula the most sought after. However, the forward had little support whenever he had the ball on the left and the danger was quickly neutralized whenever help arrived. AFC should have ended the half 2-0 up but Whyvonne Isuza’s connecting side foot shot from a well weighted Sammy Ndung’u cut back from the left went inches wide with Allan Owiny, the Thika United keeper caught flat footed. In the second half, Muyoti started off by making midfield changes, bringing in Saad Musa for Michael Mwanje. But it was AFC who began better with Oburu forcing Owiny to a good save with a shot from the edge of the box. But, Musa’s introduction for Mathare proved the masterstroke as they won more possession, spread the ball better and created more danger. However, they couldn’t do much with the increased possession as once again, they lacked the numbers upfront as AFC stuck to a flat four. Fullbacks Dennis Sikhayi and Mike Kibwage never made many forays upfront, Matano looking to keep the slim advantage. The visitors had their fair share of chances, but Shami Mwinyi, Eugine Mukangula and Said Tsuma failed to capitalize on them. After sustained pressure, AFC gave themselves the comfort of a two goal buffer when Oruchum unfortunately blasted the ball into his own net in an attempt to clear away an effort from Otieno with 15 minutes to go. Thika United XI: Allan Owiny, Anekeya Wilson, Zak Matasi, Ngotho Suleiman (C), Oruchum Christopher, Mwanje Samuel, Tsuma Said, Mutinda Michael, Shami Kibwana, Eugene Mukangula and Iregi Benson. Subs: Eliud Emase, Stephen Odhiambo, Denis Lewa, Francis Muturi, Peter Okoth, James Kinyanjui and Asaad Musa. AFC Leopards XI: Ian Otieno, Michael Kibwage, Dennis Shikhayi, Abdallah Salim, Robinson Kamura, Duncan Otieno, Musa Mudde, Marsellus Ingotsi, Alexis Kitenge, Vincent Oburu and Whyvonne Isuza. Subs: Edwin Mukolwe, Yakubu Ramadhan, Keziron Kizito, Lewis Wanami, Harun Nyakha,Victor Majid and Samwel Ndungu. After this, what next for Babu Owino? KVM starts assembling Peugeot Brands in Thika. Meet Joseph Maina The Mr Grand Ambassador Thika. SUPREME COURT RULING! Thika Reacts.